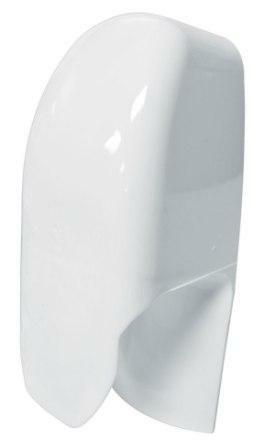 Maddak MaddaGuard Splash Guard convenient toilet aid to prevent urine splash. Helps improve toileting independence and helps prevent messes. Extra-large urine deflector helps direct urine into toilet bowl. Use on elevated toilet seats, bidets or regular toilet seats. 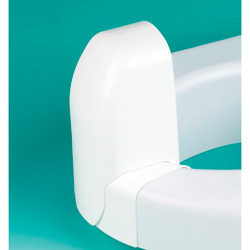 For caregivers providing in home care to individuals who need assistance in the bathroom, the Maddak MaddaGuard Splash Guard is an easy to use toilet attachment that will help improve your patient's independence and helps prevent messes. This extra-large urine deflector slides directly onto the toilet seat and helps direct urine flow into the toilet bowl. The Splash guard helps prevent urine from missing the toilet reducing bathroom messes. I wish the lower part of the plastic that goes between the legs was curved. The lower part that goes between the legs is very sharp on the skin. Absolutely positive. My grandson us on the Autism spectrum and the very day it came, he used it successfully and has everyday since. Wonderful product, simply perfect...thank you. 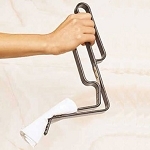 This item has been helpful in directing urine into the toilet and is great as a toilet training device. My students with Intellectual Disabilities and Autism see it and know what to do with it and urinate on the toilet after much practice and training. My nephew is 47 w/downs syndrome and alzheimers the guard doesn't work on the toilet at home with the toilet seat, also it's way to wide for his legs. Won't use it at all! The item sits on the toilet well accomplishes it's purpose. Q: 1. Can this be used on a split front seat? 2. Is this easily installed after the person is seated and removable before standing? A: The Splash Guard simply slips over and rests on the end of the toilet. 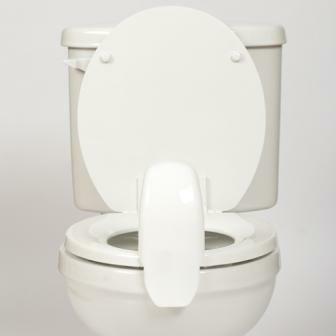 Whether it is on the seat or the bowl of the toilet really doesn't matter; although the bowl is usually not as wide as the seat is which might make the guard not fit as securely. It is easily installed and removed as needed. Q: Does this extend below the rim of the seat to prevent splashing between the seat and the bowl? A: Yes, it extends on the inside below the seat into the bowl to prevent any urine getting between the bowl and seat. Q: Do you have a smaller one? A: Currently the Maddak MaddaGuard Splash Guard only comes in the one size. Q: Will this work on an oval toilet seat? A: Yes, the Maddak MaddaGuard Splash Guard will fit over an oval toilet seat. Q: Can this item be placed once the patient has sat down, or do you have to have it in place? I need something that is easily removed and again installed. A: Yes. It is designed to slide over the front of the seat rim and can be easily installed and removed as needed. Q: What are the measurements of this devise? A: The measurements for this product are 14" x 6" x 4". Q: Do you make these a little narrower and a little shorter so they do not dig into hypersensitive person's leg or belly? Or is there a soft edging that can be applied to help eliminate friction on the sides that is easy to clean? Thank you. A: Currently the Maddak MaddaGuard Splash Guard only comes in one size. Because the product is plastic you may be able to get an adhesive cushion to put on the outer edge. Most foam cushion can be cleaned with soap and water. Q: Is this product suitable for women too? A: Yes, the Maddak MaddaGuard Splash Guard is suitable for any individuals who need assistance in the bathroom. Q: If a man is standing to urinate, does this keep from getting all overflow? Father in law refuses to sit so urine goes all over floor. A: The Maddak MaddaGuard Splash Guard is best used while sitting. If standing the product does not serve much of a purpose because of the height. Q: Will it fit a portable potty I use for him? A: It should work with a portable potty as long as the seat is at least 4 inches wide. The Maddak MaddaGuard Splash Guard sits on top of the toilet seat and can be removed when not in use if desired.